Thank you for tuning in today as we discuss five ways to prepare your home for old age. In our last post, we discussed the various benefits of being able to grow old in your own home with the aid of in-home care rather than moving to an elderly living facility. While we think it’s pretty clear that being able to grow old in the comfort and familiarity of your own home is the best and most appealing option, there are a few things that you should complete or consider as you come close to making the move to in-home care. 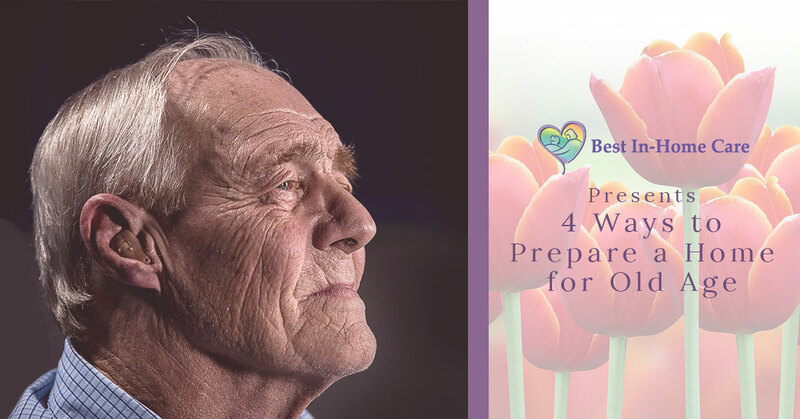 Below is a list of four things that we think are worth your consideration when preparing your home for old age and in-home care. Make your home accessible to mobility aids like walkers and wheelchairs. Becoming old is an inevitable part of life, and at some point, most people lose some form of mobility whether that is becoming restricted to a wheelchair, or in need of a walker for assistance. It might be time to think about removing the rugs and power cords that span through walkways where wheelchairs or walker will potentially be used. Another way to make a home more accessible would be to add support bars and railing in the bathroom and hallways so that when your loved one loses balance, or even just needs the extra leverage, they will have something to hold on to. Make a plan for home maintenance needs like yard work and cleaning. As your loved one gets older they will not be able to keep up with the daily chores that they are used to, and mowing the lawn will change from a 30-minute project to an insurmountable task. Services like home-cleaning services and yard-maintenance can be scheduled with companies to have weekly or bi-monthly visits. Let them enjoy their golden years and sit back and relax while someone else does all the hard work, they’ve done enough. Ditch the corded phones for something new that can be carried or left in multiple rooms. The worst thing ever would be to have your loved one fall on the opposite side of the house from the telephone. Having multiple phones spread throughout the house on wireless docks can ensure that your loved one can contact you whenever they run into a problem, or even if they just want to chat! Call Best In-Home Care LLC to ensure that your loved one receives the utmost quality of in-home care. We take pride in ensuring that families will receive the best home care assistance from our team of wonderfully talented caregivers. As a home health agency that provides home health services, we will ensure that your loved ones will be treated and cared for with the utmost respect. At Best In-Home Care LLC, we believe in letting loved ones grow old in-place, where they can live in the familiarity of their own home while feeling a sense of independence. If you have any questions about the home health care services that we provide, or even just want to talk to one of our caregivers, please don’t hesitate to contact us.